We live in an area where we often find rattlesnakes in our yard. Last year when we found a rattlesnake in our backyard, we all reacted differently. 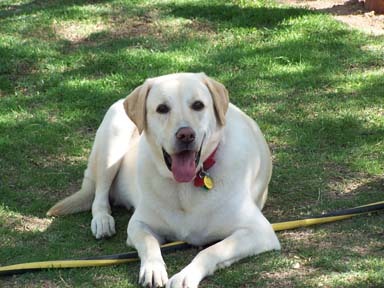 Bear, our big and lovable Yellow Lab, wanted to see if he could catch it, until we screamed “NO!” Bear is always dreaming of catching a rabbit, bird, coyote, javalina, owl, lizard, or anything that moves. Of course he is much too slow to actually come close to catching them, but rattlesnakes don’t usually run! Two nights later our neighbor’s dog was bitten by a rattler. She survived thanks to a very expensive ($1200) visit to the vet. We talked about how we really should take Bear to the rattlesnake aversion class we had heard about. We made an appointment to attend class on a Saturday night. Bear is 120 pounds of curiosity and good nature, so he was excited about a trip to go bye-bye, no matter the purpose or destination. We arrived early and Bear had a chance to roll around on the grass out front. Jay Smith explained the theory and training process and Bear had his encounter with a large, angry rattlesnake. He definitely took the training to heart! Less than one week later, when I got home from work, Bear told me there was something in the garage. He was very wary, sniffing about and acting very nervous. Could there be a snake? I nervously checked where he said it was, by kicking some of the boxes and looking behind them with a flashlight. I didn’t hear anything rattling or see anything, so I told Bear he must be mistaken. The next morning, Saturday, I was doing chores around the house and Bear was once again alerting me to the fact that there was something in the garage. I checked again and this time I picked up the large ice chest that was in the corner. We both jumped and ran when there was indeed a rattlesnake under the ice chest inside our garage. I put Bear in the house and removed the snake. When he came out, he checked around the area to make sure, and pronounced it snakefree! So, the lesson from Bear? Animals are smart and should be believed when they tell you something is wrong. Jay’s training worked great, was money well spent, and should be attended by all dog owners who don’t want their best friends to get snakebit.